Posted on August 26, 2015 by Al B. Very glad to see the Wild Fish Conservancy take this preliminary action to begin the notification of their intent to sue Federal government agencies over their evaluations of the endangered species act. If you want to see farmed salmon banned in Puget Sound, you might want to donate to the Conservancy to help their lawsuit. Tuesday August 25, 2015- Today, Wild Fish Conservancy sent a 60-day Notice of Intent to sue the United States Environmental Protection Agency (EPA) and the National Marine Fisheries Service (NMFS) for violations of the Endangered Species Act (ESA) associated with the agencies’ evaluation of the harmful effects to threatened salmonids from commercial salmon farming in Puget Sound. In 2008, EPA consulted with NMFS under section 7 of the ESA on the effects of revisions to Washington Sediment Management Standards intended to enable commercial salmon farms in Puget Sound to be permitted under the Clean Water Act. Despite the known harm and significant risks these facilities pose to wild salmonids, NMFS determined that EPA’s action is not likely to adversely affect protected species. The ESA consultation thus concluded without preparation of a biological opinion that would fully evaluate the effects of salmon farms and impose monitoring and other requirements designed to protect wild salmonids. Wild Fish Conservancy challenged the 2008 consultation as insufficient under the ESA. The Court found the 2008 consultation inadequate and set aside EPA’s approval of the revised Sediment Management Standards and further ordered EPA and NMFS to reconsider whether preparation of a biological opinion is required. 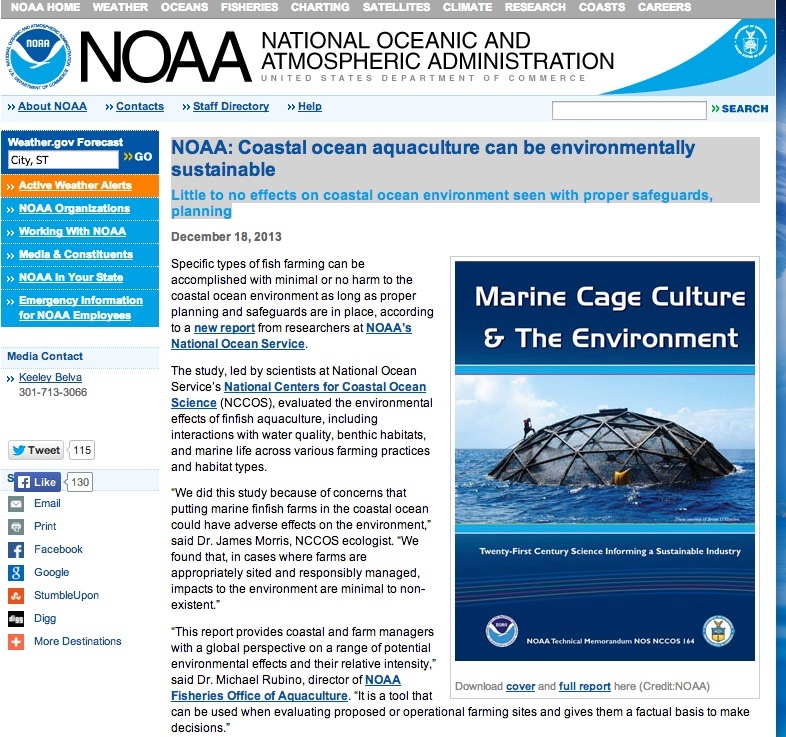 EPA reinitiated ESA consultation with NMFS in 2010. Remarkably, NMFS again determined that the Puget Sound commercial salmon farms are not likely to adversely affect threatened salmonids and declined to prepare a biological opinion. In May of 2012, there was a major outbreak of the infectious hematopoietic necrosis virus(IHNV) at the commercial salmon complexes near Rich Passage at the southern end of Bainbridge Island. The outbreak occurred at a time when juvenile salmonids were migrating through the nearshore environment near the commercial salmon facilities. It can hardly be disputed that this disease outbreak adversely affected threatened salmonids—or, at a minimum, demonstrates that commercial salmon farms in Puget Sound may adversely affect ESA-listed species. The groups are represented by Kampmeier & Knutsen, PLLC, in Seattle, WA and Portland, OR. Posted on May 11, 2014 by Al B. And the industry does not come off well. While the opening interview with salmon farming manager Ian Roberts paints a ‘normal’ picture of the industry, much to their credit, 60 minutes Dr. Gupta works in Alexandra Morton and her concerns, along with Alaskan wild salmon supporters. When he finally gets around to interviewing a government official, Brian Wallace, he comes off totally inadequate to the task of defending the government’s inaction in the face of real scientific concern. Based on this, and the rest of the scientific information that we have presented here over the last years, is it any wonder why our county commissioners have fought to create a moratorium on salmon farming in our county until more science is brought to the table on this issue? Or is it any wonder why we have been so critical of the Washington State Department of Ecology and NOAA in their bureaucratic stance that net pen aquaculture is fine, based on 25 year old science? The recently resigned Ted Sturdevant, highlighted here just yesterday, was a typical bureaucratic supporter of the industry, and stonewalled county efforts to bring even a moratorium over the last five years. Posted on January 16, 2014 by Al B. The sordid story in B.C. goes on, with the Federal government ignoring the warnings of it’s own commission. The electorate of the country needs to be the ones to act on this. The Government is clearly not going to do anything to stop the industry. The lifting a moratorium on new fish-farm applications on British Columbia’s coast won’t lead to “a free-for-all” of new requests, according to an industry spokeswoman. Ottawa put applications on hold in 2011 while the Cohen Commission investigating the state of Pacific salmon fishery. However, Fisheries Minister Gail Shea quietly lifted the freeze several months ago. Posted on December 14, 2013 by Al B.
Alexandra Morton is the leading independent researcher into net pen salmon and the diseases these fish are carrying to the wild stocks on Vancouver Island. She is standing in front of a juggernaut industry that has bought the Canadian government’s approval. Here is an overview of what she accomplished last year, and an appeal to those of us who worry that this nightmare is heading our way, to help fund her efforts. It will only happen if we do it folks. The average person out there does not even know of this threat, and continues to eat farmed salmon. Why is this important? Because there are hundreds of millions of dollars being spent to restore wild stocks, and the farmed salmon industry is buying it’s way forward, regardless of consumer demand, government concerns or scientific research that shows incredible threats to the wild stocks. Watch her short overview, and help if you can, even if all of us only gave $10 a piece, we could get enough to help Ms. Morton move keep up the good work. Posted on November 30, 2013 by Al B. Lots of news on the farmed salmon front lately. The world’s leading scientist working on educating the public on this threat, Ms. Alexandra Morton of Canada, has a new video covering the several disturbing bits of news regarding salmon farming. From Canada’s taking down of the Cohen Commission’s comprehensive web site (the government spent $26M on the commission! ), to a new genetically modified salmon, to the EU failing to properly protect the public from high levels of toxins in Norwegian farmed salmon, this 9 minute video is worth a short break from your day. It’s more clear than ever that saying no to farmed salmon is the right thing to do, and that their industry looks more and more like nuclear power, a failed experiment that just won’t go away because there is too much money at stake.